We are pleased to bring you another Christmas card on the 25th of the month...a little late, but before midnight in the Frantic Stamper time zone! 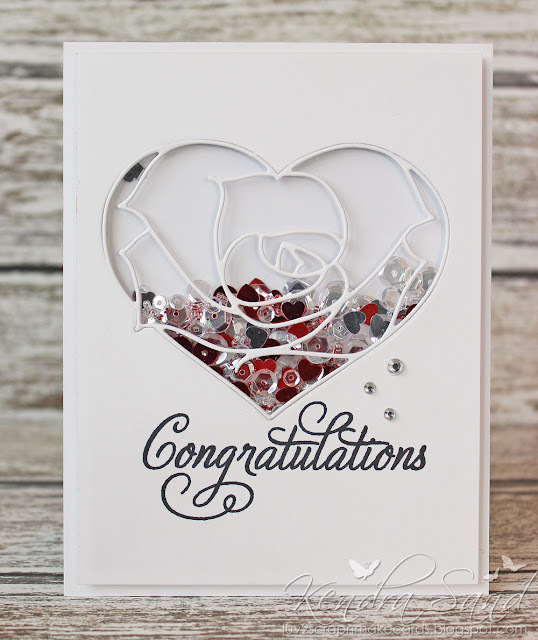 This lovely card was made by former team member Becky Carafa. we hope it will inspire you. This card was pretty involved, but the results were worth it! I die cut the Star Quilt Die a whole lot of times, from white and light blue cardstock, and from patterned paper. 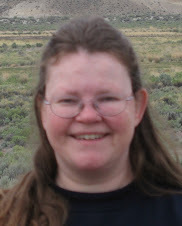 I then built all the quilt squares from the various pieces. I mounted them on a kraft base, trimmed edges, tied a silver cord bow around it, and added the sentiment. Here's a cute card that is perfect to tell someone you love them (or for Valentine's Day). It was created with the new March release Frantic Stamper dies and colored with Copic markers. The background can be varied in pattern by using different colors, or even subtle patterned papers, for the diamond shapes if desired. 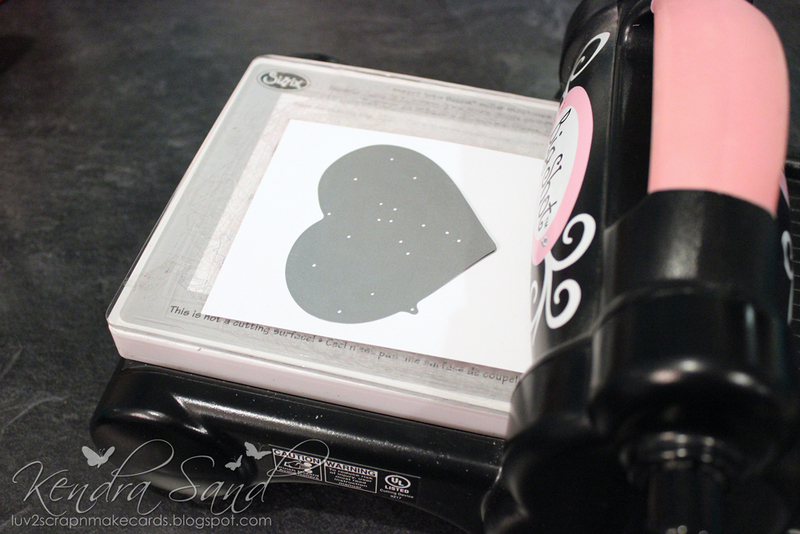 I used Wink of Stella to give the hearts and sentiment a subtle shine that looks great in person. Cut red cardstock 4 1/4 x 11 inches. 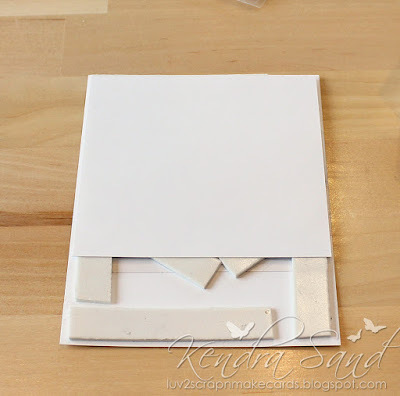 Fold in half to form a 4 1/4 x 5 1/5 inch top folding card base. 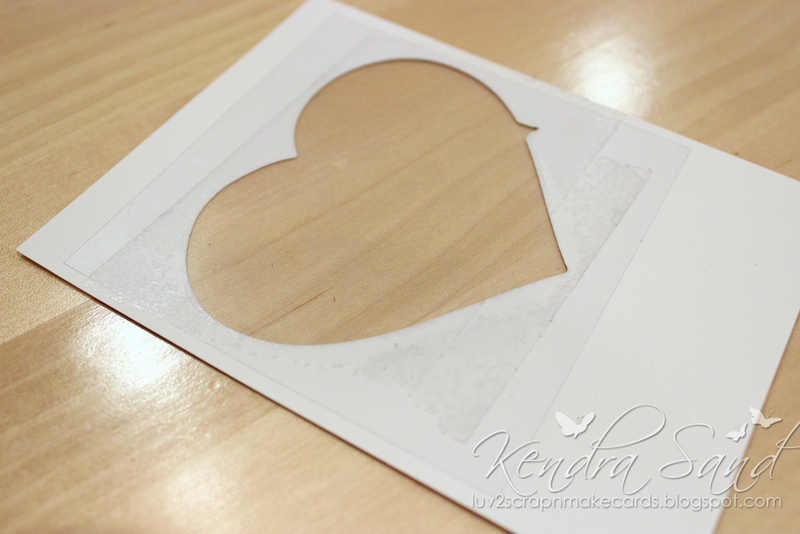 Cut 3 hearts and the word "Lovely" from red cardstock. Trim ends of "Lovely" to just "Love". Optional: coat each with clear Wink of Stella or other clear glitter pen. Add Glossy Accents to all and set aside to dry. Follow these instructions carefully. Cut a piece of clear double sided adhesive just a hair smaller than the size of the die. Die cut pink cardstock but leave the pieces in the die. You may need to use a metal cutting plate due to the detail. Remove one backing sheet on adhesive. Carefully line up and stick to die cut pieces. Be sure to rub all over, especially on the small triangles at the edges. 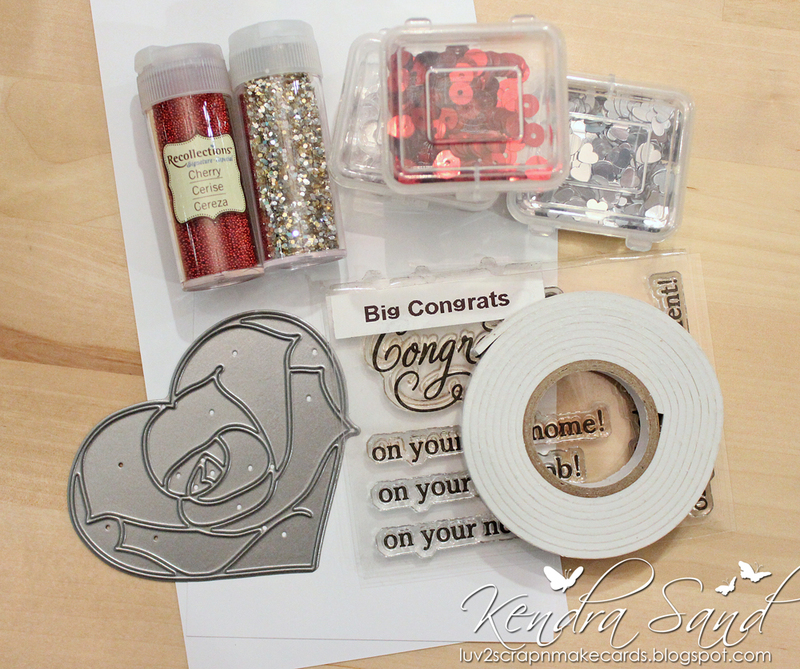 You may even want to use your die pick to gently push the smaller pieces into the adhesive. Now remove the die cuts as one piece. You may have to replace a few stubborn pieces by hand. Stick to center of card front. Note: you could cut the clear double sided adhesive larger, then trim down after the pieces are in place. 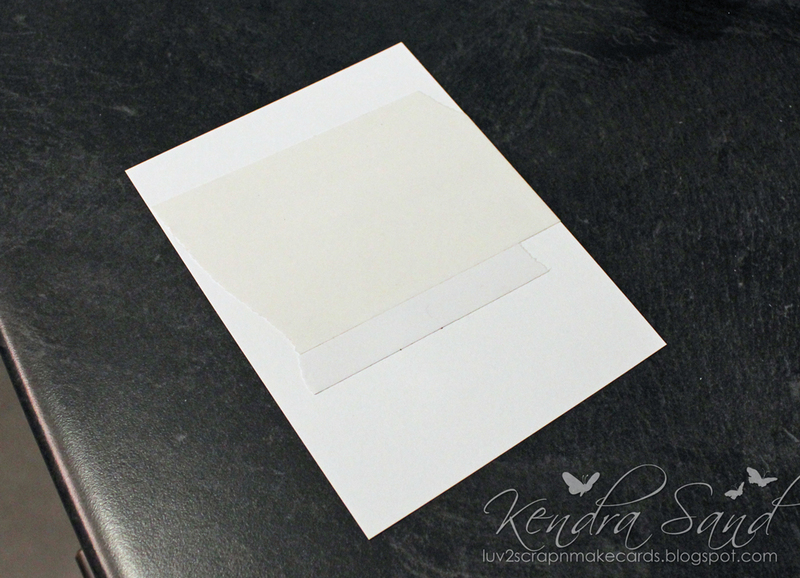 Add double sided adhesive to a piece of white cardstock just larger than the die. Die cut from cardstock side (so adhesive will be on the back). Remove white frame from die and carefully adhere over pink frame on card. Hint: I exposed the top part of the adhesive, cutting off the backing sheet just at the top, lined up the bottom and stuck the top down; then I removed the rest of the backing. This made it easier for me to line it all up. Die cut two copies of baby hedgehogs from alcohol marker friendly cardstock. On one copy of each, cut off the hair and discard the rest. These will be layered on top; color these with hair colors. On the full copies, color the hair parts in a mid or dark matching hair color so they won't be so noticeable under the top layer. Color the bodies. I used darker colors to fill in eyes and nose on each (lighter on the girl). To give them some dimension and shine, I used Tuxedo Black Pico Embellisher on the boy's eyes and nose and Desert Sand on the girl's (it is rather transparent so be sure to color with brown first). Adhere hair to each hedgehog using dimensional tape. 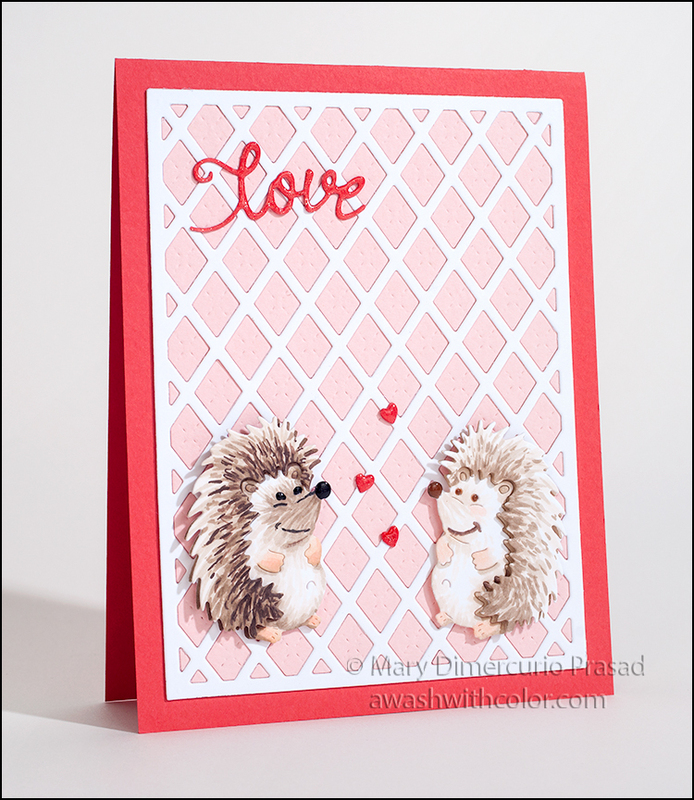 Adhere hedgehogs to card front as shown using dimensional tape. Glue hearts and "Love" where shown. Check out this wonderful video showing the process Kate used to create her beautiful leafy card. Hello, Frantic Stamper Fans! 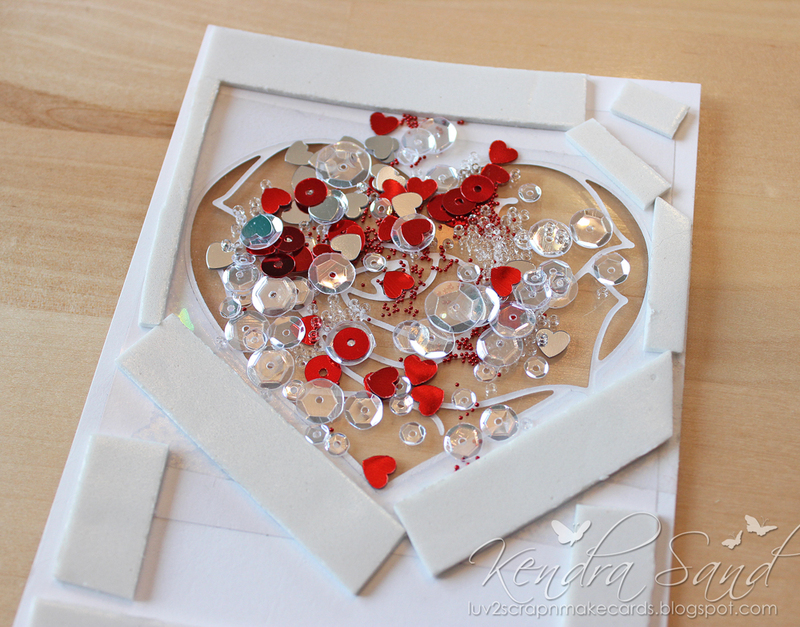 Kendra, here from Luv 2Scrap N' Make Cards to share a fun tutorial with you! I absolutely LOVE creating shaker cards, they are so much fun! I must admit I am addicted to making them! It's so much fun to see the recipients reaction to these fun cards! And yes, I am like a little kid, I love to shake them up before giving them! To me shaker cards in themselves scream FUN! I created another one to share the process! Cardstock Layer 4" x 5 1/4"
I first added some double-sided adhesive tape to the backside of my cardstock roughly to the area where I planned to run the Heart Rose Die cut through my Big Shot. I then took my cardstock layer and Heart Rose Die and ran it through my Big Shot! I carefully remove the cardstock and die cut! 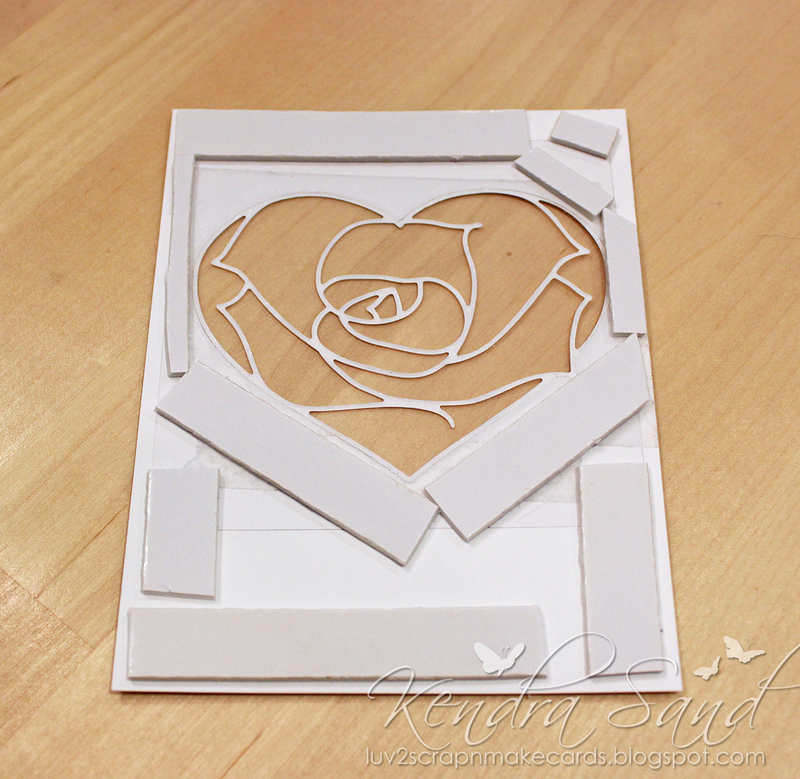 I removed all the unwanted pieces, which left me with my open heart window and the beautiful die cut heart rose. 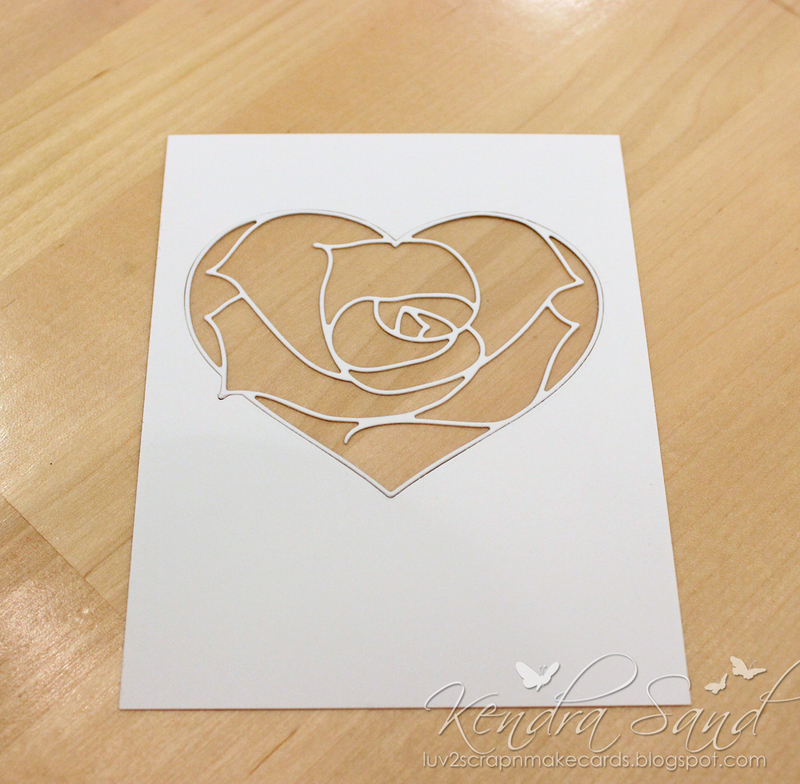 The heart rose is now a sticker, since I added the adhesive, which will make it easy to add to the acetate! No having to carefully add glue to all the tiny edges! I flipped over my card base, I may or may not have needed to add more adhesive to the back. I didn't need to, since adding the adhesive to the right side of my base earlier, I had enough, so I just needed to peel off the backing and add my piece of acetate, making sure the acetate covered the entire window. So exciting! I could have just left it like this if I wanted to, and just have the heart cut-out, but I really like the entire die and all the detail, so I flipped it back to the front and added the heart rose sticker. While on this side, I added my sentiment just under the heart. I ended up using a "Congratulations" sentiment. I flipped the card base back over and added my foam tape. It was important that I made sure that the foam tape went all the way around the entire window so all the foam was touching or else I would have a mess and the sequins would have fallen out! I removed the backing from the adhesive foam. I added sequins to my liking (being careful not to drop any on the adhesive). This is so much fun! I just love having created my own sequins mixes!! Then I added a small piece of cardstock that fits just over the window! 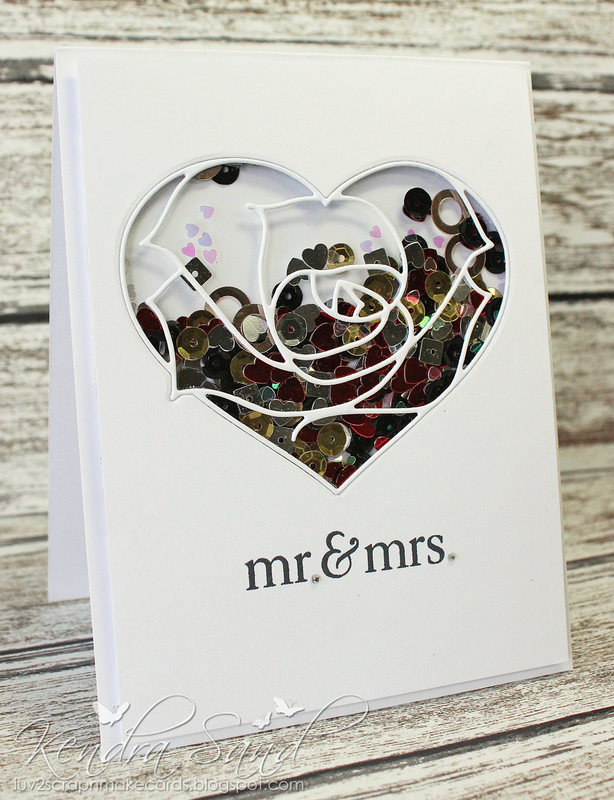 I used white cardstock for this card, but sometimes it is fun to use pattern paper! I added some tape adhesive to the piece of paper I just added. I then affixed the shaker card layer to my card base! So fun to make! The possibilities are endless!! So elegant and beautiful! And so much fun to create!! I ended up adding a few rhinestones to add a little more elegance. I hope I have inspired you to create a shaker card! Have a fabulous day!! 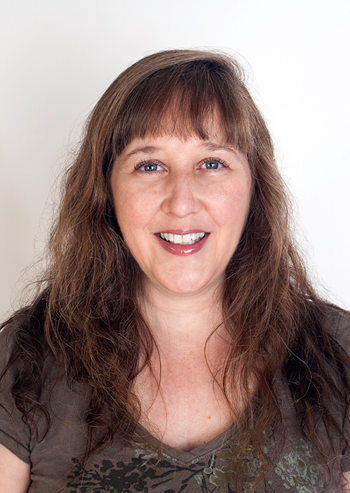 This is my first post as part of the Frantic Stamper Design Team. The theme of the month is Feminine Style. This cute little dress in pink fits the bill perfectly! Send this to a girlfriend, daughter, or other woman in your life who needs a little pick-me-up to brighten her day. Cut dark pink cardstock 5 1/2 x 8 1/2 inches. Fold in half to form a 4 1/4 x 5 1/2 inch card base. Cut light pink cardstock 4 x 4 1/4. Adhere to card base. 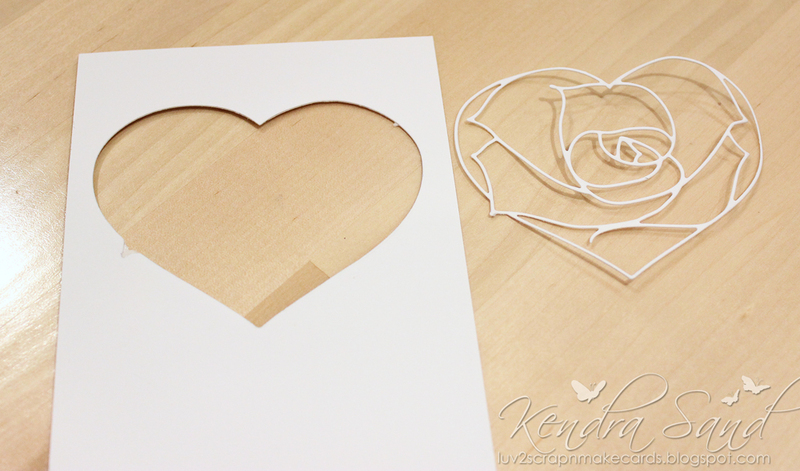 Cut pale pink cardstock to 3 3/4 x 4 inches. Using the stitches die shown, die cut long edges of pale pink cardstock. Adhere to card base. Using Pleated Dress dies, cut one top and two skirts from light pink cardstock. Emboss dots on one and fold so that the middle pleat is up and then do the side pleats, following the stitched lines. Cut the three right segments off the non-embossed skirt (i.e. cut just to the left of the 3rd stitched line counting from the right). Adhere embossed/folded skirt to plain copy, being sure to glue the sides as well as the two pleats touching the back. Hint: use a glue that will dry clear and mat. Add Rhubarb Crumble Nuvo Crystal Drops to top. Set aside to dry. Using the gorgeous die, cut two copies from light pink cardstock and one from pink. Glue the light pink copies together. Glue the pink copy slightly offset on top. Tie a bow out of the pale pink ribbon. Adhere skirt, top, bow, and gorgeous die cuts as shown. I hope you enjoy this die as much as I do! Hello! 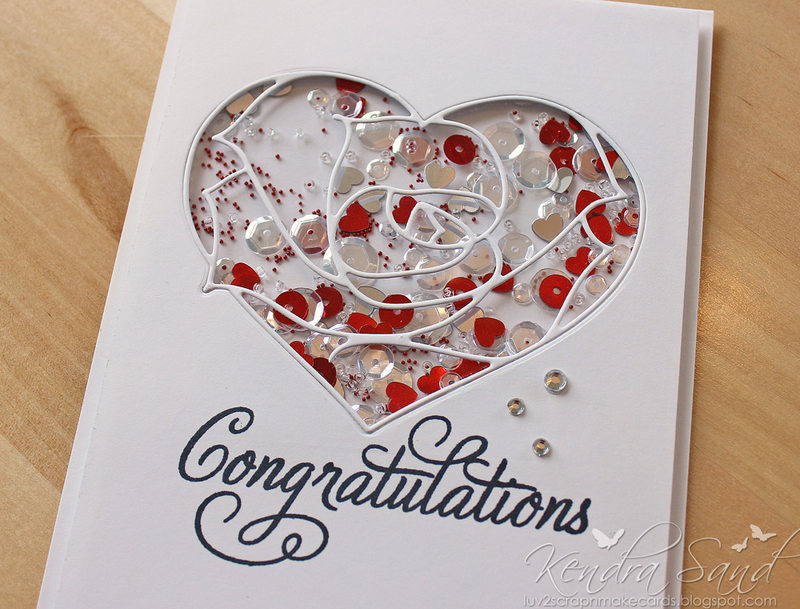 we are happy to introduce the February die release of dies from Frantic Stamper, Feminine Style. Please enjoy this month's video slideshow. The dies are available for preorder in the Frantic Stamper online store, shipping February first!